Vidyaranya flourished in the fourteenth century A.D. as the family guru of Harihara I and Bukka, the founders of the Vijayanagara kingdom. He is regarded as having been the friend, philosopher and guide of the early rulers of Vijayanagara and in the field of religion and philosophy; he is classed with the greatest of the post-Sankara Advaitins. The works that are attributed to Vidyaranya are Panchadasi, Vivarana-prameya-samgraha, Drig-drisya-viveka and Jivanmukti-viveka. The Panchadasi is a comprehensive manual of Advaita-Vedanta, enjoying great popularity with those who want to have a clear presentation of the truths of Advaita. As the Panchadasi is the magnum opus of Vidyaranya1, a brief exposition of its character and content would give an indication of the greatness of Vidyaranya and the special features of his teachings. There are two types of Advaita-works: (1) those that are intended to serve as books of instruction for the follower and (2) those that seek to show through dialectics that the philosophical positions that oppose Advaita are not tenable. The Panchadasi belongs to the first type. As Sri Vidyaranya says even at the outset, the aim of his work is to teach the supreme truth in an easily understandable manner to those whose hearts have been purified through the worship of the lotus-like feet of the Guru (i,2). It is not that argumentation and dialectics are not employed in the Panchadasi; but they are subordinated to the principal aim of conveying the light of truth to the disciple. The reasoning based on the principle of co-presence and co-absence (anvaya-vyatireka), for instance, is had recourse to for showing that the self which is of the nature of consciousness is constant and therefore real, while the phenomena constituting the world are inconstant and therefore non-real (ii, 60 ff). The method of dialectical refutation of systems such as the Madhyamika is resorted to (see e.g., ii, 30ff). The central objective of the Panchadasi, however, is to provide guidance to the seeker through instruction. While sound logical reasoning helpful to an understanding of scriptural teaching is to be welcomed, quibbling should be avoided, (see viii, 67, 68; ii, 30). When it is said that scripture is the basic authority for Vedanta, it does not mean that the Vedantin’s attitude is one of blind acceptance of, or unthinking belief in, the words of the Veda. The words are not mere sounds; they convey meaning; and the meaning should be understood. Reasoning is helpful in understanding the teaching of scripture. Although it is true that the ultimate Reality taught there is not graspable either through thoughts or through words, nevertheless logic is useful in a negative way in so far as it can assure us as to what is not real, and language is of service in indicating the nature of the Real. The final court of appeal is experience–the plenary experience which is the fruit of inquiry. In fact, the texts of scripture are but indicators of that experience. Thus, in Vedanta, the nature of the Truth is sought to be expounded on the triple basis of scripture, reasoning and experience (srutyuktyanubhutibhyah, v, 56 & xi, 89). 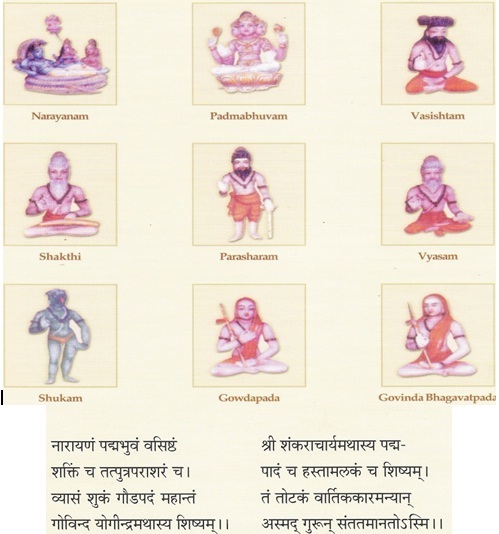 The Panchadasi is so named because it consists of fifteen chapters (Panchadasa-prakarana). The fifteen chapters are grouped into three quintads: viveka-panchaka (dealing with the discrimination of the real from the non-real), dipa-panchaka (expounding the nature of the Self as pure consciousness) and ananda-panchaka (dwelling on the bliss-nature of Brahman). It is for the sake of convenience, stated that the three quintads have for their theme the three aspects of Brahman, sat (existence), chit (consciousness) and ananda (bliss) respectively. But it should be borne in mind that such a statement could only be roughly true. The essential doctrines of Vedanta occur in almost every chapter. There are, naturally, repetitions; but repetitions are necessary for enabling the reader to understand firmly the truths of Vedanta. Sri Vidyaranya has succeeded in an eminent way in setting forth the essentials of Advaita in this great work of his–– the Panchadasi. The basic skill that the disciple should develop in himself is the ability to discriminate the real from the non-real. The Panchadasi indicates the various methods by means of which the discrimination could be gained. One of the most useful methods is the analysis of the three states of experience, viz., waking, dream, and deep sleep. As a result of such analysis one realises that the Self persists in all the states while the objects vary and are inconstant. The same conclusion may be reached by an investigation into the five sheaths (kosas) that cover the Self, as it were. The principle which is applied in this investigation is: what is grosser and more external and less pervasive is less real than what is subtler and more internal and more pervasive. Applying this principle one arrives at the truth that the Self is supremely real because it is the subtlest and the inmost being which is non-dual (see ch.iii). Just as the individual soul and its states could be analysed with a view to discovering the Self, the external objective world could also be analysed with the same end in view. Beginning with the grossest element, earth, we have progressively subtler elements; water, fire, air, and ether. But the Self is subtler than ether. One may think of the Self without ether, but not of ether without the Self. One may deny anything, but not the Self. To doubt the existence of the Self is as ridiculous as the doubt expressed by a man “Have I a tongue or not?” (iii. 20). The Self is of the nature of pure consciousness; it is unfailing light, ever-present awareness. This is explained by means of apt analogies. Like the anvil in the smith’s shop which serves as the basis for beating the metal into various shapes, without itself changing, the Self remains as the immutable witness of changes in the physical and the psychical orders; hence it is called the kutastha (see ch. viii). Just as the lamp set on a dramatic stage sheds light on all concerned during the performance, and shines also after everyone has left the theatre, even so the witness-consciousness manifests all things, viz., the egoity, the intellect, and the objects and continues to shine even when they are non-existent. Just as the lamp on the stage illumines without moving and without being affected by the movements of the actors and the audience, even so the witness which is eternal and immutable manifests all things both within and without, and their absence too (see ch. x). Just as the canvas is that whereon the various painted figures appear, both of inanimate things like mountains and animate beings like men and animals, so also on the consciousness which is the immutable Self, the variegated world appears (see ch. vi). The bliss-nature of the Self (Brahman) is explained in great detail in the last five chapters. The Self is not only existence and consciousness; it is also bliss, the supreme value. The teaching of Yajnavalkya to Maitreyi in the Brihadaranyakopanishad constitutes the basis for understanding the bliss-nature of the Self. The core of the teaching is that the Self is the seat of supreme love. Anything becomes dear, not for its own sake, but for the sake of the Self. There are, it is true, different notions of Self hood, three of which may be distinguished: the secondary self, the illusory self, and the principal self. When a parent identifies himself with his son, for instance, the self-hood of the son in relation to the parent is secondary. The identification of the Self with the body, etc., is illusory. The principal Self is the unconditioned non-dual reality. It is the Self in the principal sense that is of the very essence of bliss or love. But even when the self in the other two senses is loved, it is because of the mistaken or wrong identification with the true Self. Thus it is easy to see that the Self, whatever be the conception thereof, is the centre and seat of love. If there be love for any other object, it is for the sake of the Self to which that is subsidiary. It is a reflection of the bliss that is the Self that is experienced as happiness or pleasure in the objects. A right understanding of the happiness that is derived from the contact of the mind with the objects may serve as the door to the bliss that is Brahman. When an object is being enjoyed, the mind turns inward and becomes calm. In that state of mind the bliss that is the Self is reflected. It is this which is experienced as happiness or pleasure. The Brahman-bliss or a reflection of it is experienced in other states also. In deep sleep one experiences unqualified bliss; only that experience lies under the cover of nescience. Just before falling into deep sleep and immediately for a few moments after getting up from sleep, one has a taste of happiness prospectively or retrospectively. In the interval between two modes of the mind also, one experiences the reflection of bliss. The yogi enjoys bliss in samadhi. The jnani realises directly the bliss that is the Self. The bliss that is the Self (Brahman) is unexcellable and unconditioned. A calculus of bliss is given in the Upanishads. Starting with the unit-measure of human bliss, the higher levels are reached by multiplying each lower level of bliss by a hundred. One may thus go upto the bliss of the Creator Brahma. But Brahman-bliss is beyond all calculation. And, the wise one’s experience of the plenary bliss admits of no degrees. Having achieved all that was to be achieved and having done all that was to be done, the illumined one rests in perfect contentment and peace (xiv, 58). The nature of Brahman that is the Self is, as we have seen, existence (sat), consciousness (chit) and bliss (ananda) (see also xiii, 63). Existence, consciousness and bliss are not parts of Brahman or its attributes; they constitute its essential nature (svarupa). They are not three separate constituents; existence is consciousness and consciousness is bliss. It is because the world of plurality is characterised by impermanence, inertness and disvalue that in order to distinguish the non-dual Brahman from the world that Brahman is said to be existence, consciousness and bliss. In Brahman’s essential nature, however, there is no split and no distinction. Brahman is free from any of the three kinds of difference, sajatiya, vijatiya and svagata (ii, 20-21). How does it happen that the one Reality appears as the world of plurality? The Vedanta formulates the concept of maya precisely to show that no satisfactory answer can be given to this vexatious question since causation itself is unintelligible. There are three standpoints from which maya may be envisaged, says Sri Vidyaranya: (1) the standpoint of revealed experience (srauta), (2) that of reasoning (yauktika) and (3) that of the ordinary men of the world (laukika). From the standpoint of the ordinary worldly men, maya is real (vastavi); they have no reason to doubt its reality. From the standpoint of those who have realised the teaching of scripture, maya is unreal (tuccha); for them, there is no world to be accounted for; maya is that (ya) which is not (ma). And, for those who seek to understand through reasoning maya is indeterminable (anirvachaniya) (vi, 130). From the standpoint of reasoning, maya is uncharacterisable either as real, or as unreal, or as both real and unreal. The world of plurality appears in Brahman on account of maya, even as a snake appears in what is a rope. This is known as vivarta, transfiguration. There is no use asking questions about maya. The more we question, the deeper will the mystery become. Maya is that which makes apparently possible what is inherently impossible (vi, 235). Wonder is maya’s garment; inscrutable is its nature (vi, 139). What is necessary is that we should endeavour to transcend maya (vi, 138). And, in this endeavour, the world of plurality in which we as empirical individuals live can be a help instead of serving as an obstacle (iv, 42). The jiva is the non-dual Self appearing in a limited or conditioned form on account of nescience. In what manner is the appearance of the jiva to be understood? Sri Vidyaranya who follows mainly the Vivarana tradition, teaches a modified form of the reflection-theory or pratibimba-vada which is referred to as abhasa-vada. While the Vivarana view regards the reflection as real and as identical with the prototype, the theory sponsored in the Panchadasi holds that the reflection (abhasa) is mere appearance, an illusory manifestation. The opposition between the jiva and Brahman, according to this view, is through sublation (badha), and not through identification (aikya). The direct means to release, Advaita holds, is the path of knowledge (jnana). As moksha, is the very nature of the Self, it is not an experience which is to be brought about through works (karma). The path of knowledge consists of ‘hearing’ (i.e., study, sravana), reflection (manana), and meditation (nididhyasana) (i, 52-54). What is the immediate instrument of release? Is it sravana of the mahavakya “That thou art”? Or, is it continued meditation (also called prasamkhyana)? According to the Bhamati view, verbal testimony (sabda), of which the mahavakyas form part, can yield only mediate knowledge and not immediate or direct knowledge. If the mediate knowledge gained from verbal testimony is to be transformed into immediate experience, there should be continued meditation till this is achieved; and this is possible because the mind which is the instrument in meditation is a sense organ (indriya). The Vivarana view maintains that the mind is not a sense organ, as it is an auxiliary to all pramanas and that verbal testimony can yield immediate knowledge if the object is immediate. To illustrate this point the story of the ten travelers is given (vii, 22 ff). There is no object more immediate than the Self. Hence, the mahavakya “That thou art” imparts to the competent hearer the direct experience of the non-dual Self. Giving a citation from the Vakyavrtti, Sri Vidyaranya says, “The major texts are for the sake of imparting direct knowledge of Brahman. In regard to this there is no room for doubt” (vii, 70). Meditation, however, is not without its great use. In chapter ix, ‘Dhyana-dipa’, Sri Vidyaranya compares it to samvadibhrama, delusion which culminates in a fruitful result. The man who mistakes the lamp-light for a gem and gets to the place whence the light comes, gains nothing, whereas the person, who mistakes the light of the gem for the gem itself, obtains the precious stone. Although both are cases of delusion, the latter is a fruitful one. When the attribute-less Brahman is meditated upon, the content of meditation is not itself Brahman. But the contemplation leads to Brahman-realisation. Thus, for those who are not qualified for gaining true knowledge through enquiry, Sri Vidyaranya recommends the yoga of meditation (dhyana). In more than one place in the Panchadasi, the state of Brahman-realisation is described in glowing terms, and the incomparable happiness of the jivanmukta is praised. It is only from the standpoint of the unreleased that the continuance of the body of the jivanmukta is explained as due to the residue of prarabdha (karma which is responsible for his present body), and illustrations, such as the continued rotation of the potter’s wheel for a time even after the propelling rod has been removed, are offered. In truth, however, the mukta has no body, and there are no grades of mukti. In the Panchadasi, Vidyaranya reveals himself as a writer not only with great philosophical insight but also with equally great literary skill. The Panchadasi is not only a veritable mine of Vedantic treasure, but is also a work with poetic charm that delights the reader. No wonder, it is one of the most favoured texts and has found a permanent place among the Advaita classics. And, Vidyaranya, its author, takes his rank with the best preceptors of Advaita after Sankara. His contribution to Advaita is as immense as it is abiding. 1. There is a tradition that the Panchadasi is the joint work of Bharatitirtha and Vidyaranya. Another view is that it is the work of Bharatitirtha who also bore the title ‘Vidyaranya’.